ESSENTIAL QUESTION: How do you get elected President? Carousel Exercise: Groups of students will create a list of the steps to run a successful campaign for President of the United States; the list will be no more than 10 steps. Groups will then move around the room analyzing the other posted lists—using a check mark for a task which they also had on their list, an exclamation mark for an important task, a question mark for an unclear task, and an x for an irrelevant or missing task. The entire class will discuss and create a formal 10 step list based on their analysis. ESSENTIAL QUESTION: What is the Electoral College and how does it function? · What strategy do you intend to use in order to get 270 electoral votes? Will you focus your resources on winning the biggest but most difficult states or will you build up your ‘war chest’ by capturing the electoral votes and resources of smaller states before contesting the largest states? · Identify one state where your party already has an advantage. Why do you think your party has an advantage in that state? Has your party won that state in past elections? · Who won the election? · Why do you think this candidate won the election? Did their strategy pay off? · Compare your electoral map to the real results from past campaigns online. What election seems to be the closest parallel to your results? This MUST be turned in BEFORE the end of class today--any assignment turned in late will be penalized 1 point. ESSENTIAL QUESTION: What are the Constitutional powers of the President? ESSENTIAL QUESTION: What are the Constitutional Responsibilities of the President? · What are the FOUR major events taking place during the day at the Bartlett White House? · What are the 5 Constitutional responsibilities the President has in the US government? · What Constitutional role is the President playing at each of the events taking place? · At one point, the President’s staff is introduced to Carl Everett. Mr. Everett is described as a ‘serious campaign fundraiser for the party’. What other informal political role does this imply for the President? · What THREE specific Constitutional powers does the President threaten to use if the Truckers’ Union and Management don’t settle the strike by midnight? · Does the Bartlett Administration uses a Circular, Pyramidal, or Ad Hoc management structure? What is your evidence (be specific)? Makeup: Watch Democracy in American #7: The Modern Presidency and answer the assigned questions on the worksheet in complete sentences. This MUST be turned in within 24 hours of your absence--any assignment turned in late will not receive full credit. 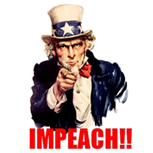 ESSENTIAL QUESTION: What is an impeachable offense? Impeachment Activity: You have been selected by the Speaker of the House as a member of the House Select Committee on Impeachment. Your job is to investigate charges against the President, and report out a resolution to the Speaker. If your committee feels there is not enough evidence to charge the President, your resolution will recommend not pursuing impeachment; however, if your committee feels it does have enough evidence, you will recommend specific charges of impeachment and the full House will then debate and vote on each charge. To recommend impeachment, you must believe your committee has enough evidence to prove one or more of the following: Treason, Bribery, or other High Crimes and Misdemeanors. These charges do not have to be proven "beyond a reasonable doubt”, the burden of proof must only be "clear and convincing” enough for 2/3rds of the Senate. In groups, Read for the Rubric, Organize your Essays, and OUTLINE the possible ideas and conclusions which would receive credit under the COMPLETE-CORRECT-CONNECT guidelines. 1. Nominees for the presidency of the two major parties are chosen by delegates at national conventions. B. The Republican Party uses winner-take-all primaries. Define a winner-take-all primary and describe one consequence of winner-take-all primaries for the Republican nomination process. C. The Democratic Party uses superdelegates in the presidential nominating process. Define superdelegate and describe one consequence of superdelegates for the Democratic nomination process. D. Explain why a candidate’s strategy to win the general election is usually different from the strategy used to win the party’s nomination. 2. The Constitution of the United States creates a government of separate institutions that share power. Frequently, this means that presidents and Congress struggle with each other. A. For each presidential power below, explain one way congressional decision making is affected by that power. B. For each of the congressional powers below, explain one way that presidential decision making is affected by that power. C. Explain how the case of US v Nixon shifted the balance of power between the President and Congress. 3. Constitutionally, Presidents are limited in their influence over Congress in the area of domestic policy, but Presidents can have some impact on domestic policymaking in Congress. A. Identify two of the President’s informal or implied powers and explain how those powers enable the President to exert influence over domestic policy. B. Choose one of the following. Define the term and explain how it limits the President’s ability to influence domestic policymaking in Congress. C. Explain how Train v New York City limited the President’s ability to influence domestic policymaking in Congress. 4. A significant feature of the electoral college is that most states have a ‘winner-take-all’ system. B. Explain one way in which the ‘winner-take-all’ feature of the electoral college affects how candidates from the two major parties run their campaigns. C. Explain one way in which the ‘winner-take-all’ feature of the electoral college hinders third party candidates. E. Explain two reasons why the electoral college has not been abolished. Review: Unit 1, 2, 3, and 4: Use online chapter notes, GRQs, and Textbook site practice section quizzes. ALL UNIT 4 FORMATIVE REASSESSMENTS ARE DUE; NO MORE REASSESSMENTS FROM UNIT 4 WILL BE ACCEPTED AFTER TODAY. This test will consist of 45 multiple choice questions in 35 minutes (summative), and one 10 minute FRQ (formative) from the material and concepts in Units 1, 2, 3, and 4. Bring: Pencil for Unit 4 test! ESSENTIAL QUESTION: What is the relationship between the President and Congress? Where did Presidential Advisor Angela Blake learn that the Republicans will give up their Capital Gains Tax Cut if the Democrats will give up tuition subsidies? Who does Haffley say is pushing him to demand the budget cuts be raised to 3%? What power would the President use to deny Haffley’s budget bill? Who does Press Secretary CJ Craig say will be kept working during the shutdown? What does Speaker Haffley say all the furloughed workers in his district should do? Why does Haffley say ‘Christmas came early’? What does Vice President Russell tell Chief of Staff McGeary about the budget process after he volunteers to negotiate with Congress? Who does he say to blame? Speaker Haffley says: “we are doing what the voters wanted us to do when they elected us.” What theory of congressional behavior is this? What does Donna discover will happen to Social Security? Why does this frighten Toby, and how does it fit in with your understanding of interest groups and congressional behavior? Why does Josh Lyman say the President should have more say than the Speaker over the budget? Do you agree or disagree? What does Josh recommend the President do to capture the initiative in the budget battle? What does the Speaker say the President’s real job is supposed to be? What does he say Congress’ is supposed to do according the Constitution? Is he correct? What power does the President say was given to him by the Constitution, and how does this relate to the budget crisis? How is the Budget crisis resolved, and how similar is this to the budget crisis we just experience this past month? Read: Article III of the US Constitution. Makeup: Watch Democracy in American #8: The Bureaucracy and answer the assigned questions on the worksheet in complete sentences.